South Dakota is the 17th ship of the Virginia Class, which provides the Navy with the capabilities required to retain undersea dominance well into the 21st century. South Dakota is also the seventh of the eight-ship group of Virginia-class submarines known as Block III. These ships embody a Navy and industry commitment to reduce costs while increasing capabilities through an initiative comprising a multi-year procurement strategy, improvements in construction practices and the Design For Affordability (DFA) program. "Delivering South Dakota is a significant achievement that represents the hard work and excellent performance of our shipbuilders, helps the Navy meet its shipbuilding goals and contributes to the nation's defense," said Electric Boat President Jeffrey S. Geiger. He also recognized the contributions of the Navy and the supplier base. Virginia-class submarines displace 7,835 tons, with a hull length of 377 feet and a diameter of 34 feet. They are capable of speeds in excess of 25 knots and can dive to a depth greater than 800 feet, while carrying Mark 48 advanced capability torpedoes and Tomahawk cruise missiles. General Dynamics Electric Boat has established standards of excellence in the design, construction and lifecycle support of U.S. Navy submarines. In its position as an industry leader, Electric Boat remains committed to applying its technical and business expertise to effectively manage the challenges of nuclear-submarine production. The company's three primary locations are in Groton and New London, Conn.; and Quonset Point, R.I. Its current workforce is approximately 17,000 employees. On September 21, 2017 General Dynamics Electric Boat delivered the nuclear-powered attack submarine Colorado (SSN 788) to the U.S. Navy. Delivery of the Colorado marks the third ship to be delivered in just over 12 months by the Virginia Class Team. This ad, which first appeared in October 2017, was developed by Karl Smizer of Smizer Design, Weymouth, MA. Colorado is the 15th ship of the Virginia Class, which provides the Navy with the capabilities required to retain undersea dominance well into the 21st century. Colorado is also the fifth of the eight-ship group of Virginia-class submarines known as Block III. These ships embody a Navy and industry commitment to reduce costs while increasing capabilities through an initiative comprising a multi-year procurement strategy, improvements in construction practices and the Design For Affordability (DFA) program. "This delivery demonstrates the skill and commitment of everyone involved in the Virginia-class submarine program," said Electric Boat President Jeffrey S. Geiger, recognizing the contributions of the Navy, the shipbuilders and the supplier base. "Delivering Colorado is a significant achievement that helps the Navy meet its shipbuilding goals and ensures our continuing success as a business." General Dynamics Electric Boat has established standards of excellence in the design, construction and lifecycle support of U.S. Navy submarines. In its position as an industry leader, Electric Boat remains committed to applying its technical and business expertise to effectively manage the challenges of nuclear-submarine production. The company’s three primary locations are in Groton and New London, Conn.; and Quonset Point, R.I. Its current workforce is approximately 15,800 employees. This advertisement, promoting the Navy's next-generation strategic deterrent submarine, appears in trade journals and was developed by Karl Smizer of Smizer Design, Weymouth, MA. The Ohio Replacement will accommodate 16 missile tubes within a 43-foot diameter hull, displacing nearly 23,000 tons. It with be designed with the stealth and other characteristics to meet projected threats until the end of its 42-year service life, which for the last ships of this class will be in the 2080s. Electric Boat designed and built all 18 of the original Ohio-Class submarines that were commissioned between 1981 and 1997, and will begin retiring in 2027. Electric Boat has been working on concepts for the Ohio Replacement for several years. In January 2011 the Ohio Replacement Program achieved Milestone A, which validated the program's technology development strategy and allowed entry into the technology development phase during which warfighting requirements will be refined to meet operational and affordability goals. In December 2012 Electric Boat was awarded a five-year research, development, test and evaluation contract for Ohio Replacement design, and in 2017 the company is expected to begin work on detailed design. The first ship will start taking shape in 2021, and after seven years of construction and three years of testing it will enter operational service in 2031. Key to the development of an affordable ship is the Common Missile Compartment for undersea forces of both the United States and the United Kingdom, which will spread the cost over two strategic deterrent programs. The U.S. and U.K. have cooperated on strategic deterrence since 1963 under the Polaris Sales Agreement. The Navy will leverage Virginia class technologies, components and material to avoid new design cost and increase submarine force commonality. This is expected to include a scaled propulsor, universal modular masts, the ship control system, the large aperture bow array, hull coatings, non-propulsion electronic system, torpedo tubes as well as various valves, heat exchangers and pumps. The Ohio Replacement is developing numerous new initiatives to make sure its technology is up to the challenges of the 21st century. Key among them is the new build strategy for the Missile Compartment, the Integrated Tube and Hull manufacturing process. Ohio Class ships were built by constructing the hull, then loading the missile tubes into the hull and outfitting each of those tubes inside the hull. The design of the Virginia class showed that significant savings are possible through modular construction and that will be taken to new lengths in the Ohio Replacement. The ITH build method combines four fully outfitted missile tubes by using a special fixture, which then integrates them into the surrounding pressure hull to form a "Quad Pack," saving many months of construction time and millions of dollars per ship. In addition, Ohio Replacement will feature an X-stern to improve maneuverability, and the first modern submarine electric drive. A reliable, survivable platform is more critical than at any time in the past, because SSBNs will be carry about 70 percent of deployed strategic nuclear deterrent warheads under New START treaty. More than 7,000 Electric Boat employees and guests were on hand to witness First Lady Michelle Obama christen the Illinois, the 13th Virginia-class submarine. This ad, which first appeared in October 2015, was developed by Karl Smizer of Smizer Design, Weymouth, MA. Illinois is the third of the eight-ship group of Virginia-class submarines known as Block III. These ships embody a Navy and industry commitment to reduce costs without decreasing capabilities through an initiative comprising a multi-year procurement strategy, improvements in construction practices and the Design For Affordability (DFA) program. The DFA program focuses primarily on the redesign of the submarine's bow, lowering program costs by $800 million, increasing capability and providing the capacity for additional growth at no additional cost. This redesign replaces a sonar sphere with a Large Aperture Bow (LAB) Array and the 12 individual vertical-launch missile tubes with two Virginia payload tubes (VPTs), which will each initially carry six missiles in multiple all-up round canisters. The new LAB Array eliminates hundreds of hull penetrations and replaces tranducers with lower cost, life-of-the-ship hydrophones. By nearly doubling the payload space available from 1,200 cubic feet with the 12 vertical launch tubes to 2,300 cubic feet, the VPTs will enable Virginia-class ships to deploy a wider variety of payloads. On August 29, 2014 General Dynamics Electric Boat delivered the submarine North Dakota (SSN-784) to the Navy on schedule and more than $30 million under target cost. This ad, which first appeared in October 2014, was developed by Karl Smizer of Smizer Design, Weymouth, MA. "The finest submarines in the world are built right here." said Secretary of the Navy Ray Mabus during a visit to the Groton facilities of Electric Boat September 17, 2014. He continued, The United States "owns the undersea domain, thanks to the submarines built in Groton and the crews that man them." North Dakota is the first of the eight-ship group of Virginia-class submarines known as Block III. These ships embody a Navy and industry commitment to reduce costs without decreasing capabilities through an initiative comprising a multi-year procurement strategy, improvements in construction practices and the Design For Affordability (DFA) program. "The full range of Block III improvements were successfully tested during North Dakota's sea trials," said Kurt Hesch, vice president and Virginia program manager, noting that the submarine received the highest quality score to date from the Navy Board of Inspection and Survey. "This is an important accomplishment that reflects the skill and commitment of everyone involved in the Virginia-class submarine program." "We continue to meet the Virginia Class standard of delivering submarines early, under cost, more complete and ready for tasking right out of the shipyard," said Program Executive Officer for Submarines Rear Adm. David C. Johnson. "North Dakota set a new benchmark for excellence in what is the arguably the best performing program in defense acquisition." "Unequalled Predator and Industrial Benchmark"
Director – Undersea Warfare Division. This advertisement, promoting the Navy's next-generation strategic deterrent submarine, appears in spring 2013 trade journals and was developed by Karl Smizer of Smizer Design, Weymouth, MA. Electric Boat designed and built all 18 of the original Ohio-Class submarines Ohio Class that were commissioned between 1981 and 1997, and will begin retiring in 2027. The Ohio Replacement is developing numerous new initiatives to make sure its technology is up to the challenges of the 21st century. Key among them is the new build strategy for the Missile Compartment, the Integrated Tube and Hull manufacturing process. Ohios were built by constructing the hull, then loading the missile tubes into the hull and outfitting each of those tubes inside the hull. The design of the Virginia class showed that significant savings are possible through modular construction, and that will be taken to new lengths in the Ohio Replacement. The ITH build method combines four fully outfitted missile tubes by using a special fixture, which then integrates them into the surrounding pressure hull to form a "Quad Pack," saving many months of construction time and millions of dollars per ship. In addition, Ohio Replacement will feature an X-stern to improve manueverability, and the first modern submarine electric drive. On May 2, 2012, General Dynamics Electric Boat delivered the submarine Mississippi, SSN 782, to the Navy. The ship was 363 days ahead of an already shortened schedule and more than $60 million under target cost. In fact, every submarine delivered by Electric Boat since the first of the class, USS Virginia, has been ahead of schedule, an important component in reducing the cost of the submarine. This ad first appeared in June 2012 and was developed by Karl Smizer of Smizer Design, Weymouth, MA. "This company, these shipbuilders can get it done if we give them the work order," said the Chief of Naval Operations, Adm. Jonathan Greenert, who was visiting Electric Boat on the day of the delivery and announced it at a press conference with Congressman Joe Courtney that morning. "And that's the most efficient approach." Virginia took 86 months to construct. As a result of an impressive learning curve the schedule for Mississippi had been cut to 74 months, but that schedule was bettered by almost 12 full months. The 62-month construction span for Mississippi beat by three months the previous record for a Virginia class submarine, set on the USS Missouri, delivered by Electric Boat in 2010. Capt. John McGrath, commanding officer of Mississippi, called it a "tremendous achievement." Electric Boat President Kevin J. Poitras said as impressive as the shipyard's performance was on Mississippi, progress on the North Dakota, SSN 784, the first ship of Block III, has been improved further, despite the fact that the bow of the ship has seen some significant design changes to reduce cost and improve capability. That kind of continuous improvement is absolutely necessary so that the Navy can afford the submarines that it needs, he said. This ad, promoting the concept of the Virginia Payload Module, debuted in Spring 2011 in trade journals, and as a graphic in the Electric Boat booth at the Navy League of the United States' Sea-Air-Space symposium outside Washington D.C. When Ohio-class SSGN submarines joined the fleet beginning in 2005, they provided the U.S. Navy with a significant increase in stealthy, survivable strike capacity. To retain this capability when the SSGNs begin coming off the line in the 2020s, General Dynamics Electric Boat has a proposed an effective and affordable solution - the Virginia Payload Module, or VPM. The VPM comprises four additional large-diameter payload tubes in a mod¬ule inserted amidships in Virginia-class submarines, extending the hull by 70 to 80 feet and boosting the strike capacity by more than 230 percent per ship, but increasing the cost less than 15 percent. The VPM allows for distribution of strike assets, giving theater commanders greater discretion in staging payload and allowing them to more easily cover widely separated targets. 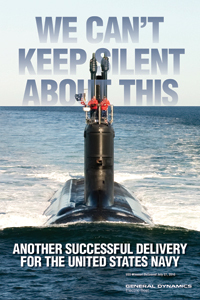 Playing off the theme of the 'Silent Service', this advertisement, which debuted in 2010, announced the latest in a string of successful deliveries by the Virginia Class program. USS Missouri, SSN780, was delivered nine months early, in a record breaking 65 months, and was 8 percent below its target cost, another triumph for the EB-US Navy-Vendor submarine team. The image of Missouri shows the ship on its sea trials off New London. The ad was developed by Karl Smizer of Smizer Design, New London. If you would like a poster of this ad email grose1@gdeb.com - While supplies last. Missouri was delivered in 65 months, five months faster than any Virginia Class Submarine before it, and $100 million under target cost, continuing the continuous improvement trend demonstrated by the Virginia Class. It was the most complete at delivery, including a lot of work that was previously was done after a shakedown period, making it of greater value to the fleet from the time it entered service. The Virginia Class continues to be cited by top Navy and Department of Defense officials as a model procurement program. Here's the Chief of Naval Operations, Adm. Gary Roughead, in testimony to Congress: "We are introducing affordability in our aviation an shipbuilding plans and realizing significant savings. For example, on the Virginia Class Multi-Year Prodcurement alone, the savings has been $3.2 billion." And here is the Honorable Ray Mabus, Secretary of the Navy, addressing the SECNAV Current Strategy Forum at the U.S. Naval War College in Newport, RI: "I expect industry to make the necessary investments in infrastructure and in training to build (Navy) ships. I also expect that both cost and construction time will come down with each successive platform built. Some of the classes of ships and aircraft that we have built have been incredibly successful at this, like the Virginia class attack submarine."